When I originally fenced the chicken pen, I used free welded wire fencing given to me by a friend that had moved. But at the chickens have grown, the space became insufficient, and too-heavy traffic meant that the grass was being destroyed. So when my wife saw several rolls of welded wire fencing and a dozen or so metal stakes on a Facebook buy/sell group for $35, I told her to get it. Using the new fencing, I came close to doubling the area the chickens can roam. Finally, I spent another $16 on another 50 lb bag of chick feed. At our local Amish-run bulk food store and dented can store, I bought a new straw hat for myself for $12, a wide metal spatula for the wife at $6, and a ceramic pie plate for the wife at $4. I also spent $1 on a wide knit elastic band at Wal-Mart, for my wife to sew into my new hat. 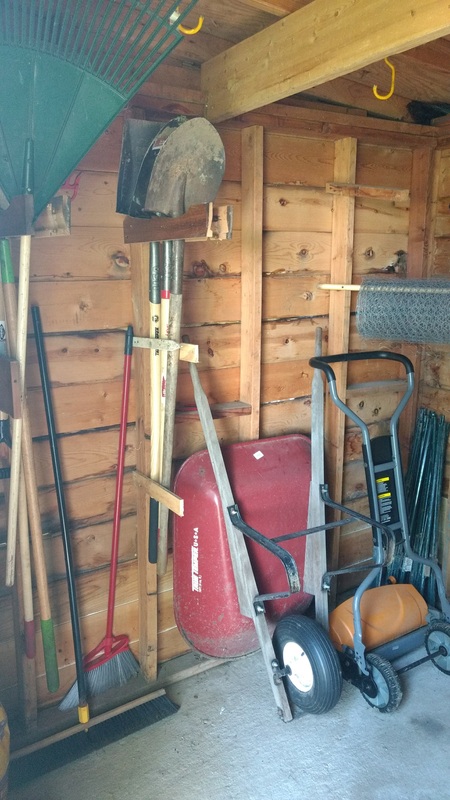 I cleaned out and organized my garden shed, making some wooden mounts to hold shovels, rakes, hoes, and such that had previously all been leaning against the walls. Since two of my brothers came to visit for a few days, I had them remove some of the hideous red landscape stones that are on the South and West sides of the house. And at True Value I bought a new chain saw tool for my chain saw, as my old one was somehow misplaced when we moved. I had a $150 Cabela’s gift card, and I decided to use it to buy equipment for my muzzleloading rife, which is currently my only hunting rifle. I ordered 1,000 209 primers for $30, 1 lb of Pyrodex Select for $24, a brass powder measure by CVA for $10, a synthetic bullet starter for $5, a tube of bore butter for $10, 100 .50 cal lead round balls for $18, and 100 lubed patches for $8. Because my wife and I both have a fair number of siblings, I also started on Christmas gifts. At that Amish-run dented can store, I was able to buy 4 old-fashioned safety razors for $16. I then ordered 4 badger hair brushes off of Amazon for $22, along with a 5-pack of William’s Mug Shave Soap for $11. This was paired with 4 matching coffee cups that we had on hand and 4 packs of Wilkinson Sword brand razor blades that I had on hand from a previous order of 100 packs to create a nice starter shave set for each of the wife’s 4 oldest brothers. For the wife’s 2 young sisters, I purchased corn lobby brooms, which are just the right size for little girls that like to help around the house. The brooms cost $12. 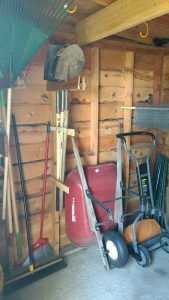 For the wife’s youngest brother, I bought a TrueTemper kid’s wheelbarrow, which I got on sale at True Value for $28. Finally, in a splurge, I purchased a pouch of each of Missouri Meerschaum’s four new pipe tobacco blends from Smokingpipes.com. I couldn’t decide which pouch to buy, so I decided to try all four and see which I liked best. The tobacco cost me $24 with shipping. In all, I spent $370 in July on projects and purchases, which exceeded my budget of $300 by $70. However, $150 of that was spent on a gift card, so the net impact on my finances was $220. Still, I decided to carry my $70 overage into August, giving me a budget of $230 for August project and purchases spending.